I hope that by now most of you are already signed up for Swagbucks. The best way to start earning Swagbucks so you can get your $5 Amazon gift cards (let’s face it, that’s what most of us are after) is to do all your Internet searches on Swagbucks. And for that, I love using the Swagbucks toolbar. If you haven’t installed the toolbar yet, here’s how to do it in four easy steps. 1. Log into your account on the Swagbucks homepage. 2. Click on the Toolbars tab at the top of the page. 3. Click on the big purple Download button. 4. Open the downloaded file (this may happen automatically on your computer) and follow the install instructions. The toolbar will work on Firefox, Safari or Internet Explorer. 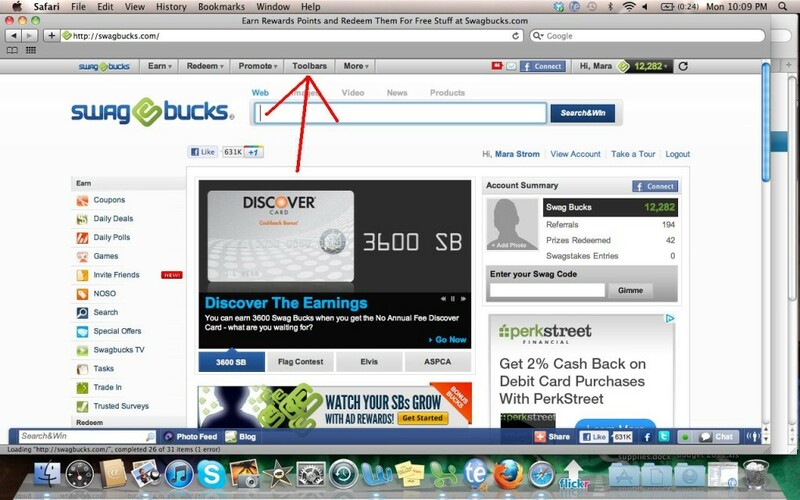 Not only does the Swagbucks Toolbar instantly tell you how many ‘bucks you have (love that part), it also lets you search with ease. Just enter what you’re looking for in the white space next to the blue & green Swagbucks logo and press enter. There are lot of other ways to earn Swagbucks, which are embedded into the toolbar. So once you download it, you will be able to take advantage of more ways to earn free Swagbucks. Are you as much of a Swagbucks fan as I am? What’s your favorite Swag reward?